We hope everyone has been staying both warm and healthy – helped by some hearty soups and stews with the veggies from your share! This month’s share will be similar to last month’s only with more of the root vegetables to make those soups and stews. Apple (1 bag) and Apple Cider (1 bottle) shares for those who get them. There is also a Lewis Waite delivery tomorrow so be sure to remember to tell your volunteers to give you your order. Thank you to Nora Gamer who kindly volunteered for the early shift on Jan 11th. We recently sent out the email and posted on fb and our website the early sign-up information for the 2018 full season. For your convenience the Membership Agreements are attached and we will have copies available at Thursday’s pick-up. At the pick-up you may pay in cash, by check, credit card or with PayPal. Members signed up before March 1st will be able to choose preferred dates for volunteering. And as in the past, if the cost of CSA membership is a financial burden, please reach out to us about our confidential price reduction. SAVE THE DATE! The Flushing CSA annual Meet the Farmers event will be Sunday, March 18th from 2:00 – 6:00 pm at the Quaker Meetinghouse. It will be an exciting event that will include a screening of the documentary “Farmers for America”. You won’t want to miss it! Details will be sent at a later date. Follow us on Facebook, Twitter and Instagram. We can also use some volunteers to help with various tasks – set-up, greeters, refreshments, closing up or you may want to do something you’re interested in. Please let us know. Watch a film screening of Joy Luck Club on Sun, Feb 11 at the Lewis H. Latimer House Museum. Kick-off the Year of the Dog with the Flushing Chamber on Sat, Feb 17. Start with a breakfast reception at the Flushing Chamber (13532 38th Avenue, Flushing) at 9:30 am and then head out together to the parade starting at 11am. Dress up, bring signs, and banners if you plan to march with them! Have fun with crafts and learn about ‘lucky plants’ of Lunar New Year at the Queens Botanical Garden on Sat, Feb 17, 12pm. Celebrate this auspicious occasion with paper-cutting, lantern making, Korean food, and performances at Flushing Library on Sat, Feb 24, 10:30am. Forget the groundhog. The days are certainly getting longer and we start seeding in the greenhouse in about 3 weeks, so I’m just going to go ahead and plan on spring coming soon. Until then, we have lots of delicious winter veggies to fill up your kitchen, your table, and your bellies. I’ve been supplementing our own produce at the grocery store this winter and it’s pretty depressing, Everything looks limp, lifeless and sad. What a difference when I opened up the winter share box this afternoon! 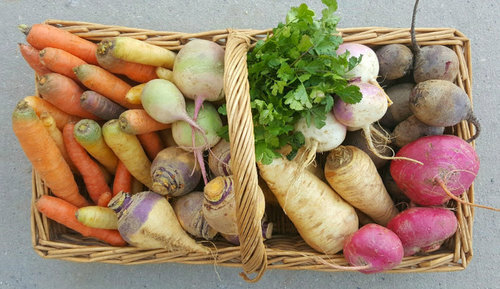 Even though these root veggies have been stored in our coolers for the past few months, they are so full of vibrancy, color and nutrition. They’re also bursting with flavor! My week’s menu includes celeriac soup, sweet potato pie, rutabaga & root veg galette, juiced carrots and beets and hash browns. What are you guys making? Post your recipes and tips on our Members Facebook page and follow along on our Instagram feed to see what we’re cooking here in the farmhouse kitchen. Bon appetite! Previous Apply for Flushing CSA’s 2018 Season! Flushing CSA (February 7) Update! Flushing CSA (Winter Share #2) Update! Flushing CSA (Week 25): Last Pickup! Flushing CSA (Week 23) Update! Flushing CSA (Week 22) Update! Flushing CSA (Week 21) Update! CSA Harvest Festival: Sunday, October 14! Flushing CSA (Week 19) Update! Flushing CSA (Week 18) Update!